Full payment at time of booking, then no refunds. Each of our 3 locations has different directions. We will provide full driving directions and interactive maplinks once booked. Huon Valley Escapes has three quite different glamping experiences that combine nature, adventure, simple accommodation and comfort. Experience Tasmania's wilderness and wildlife firsthand. Deluxe Tipees less than an hour drive south of Hobart, a remote wilderness camp deep inside the World Heritage Wilderness Area or a self contained holiday home at Lune River, the southernmost accommodation in Australia. We can also arrange city hotel accommodation before or after your glamping experience. Huon Valley Escapes can design an itinerary for you that includes these glamping accommodations and activities along the way. 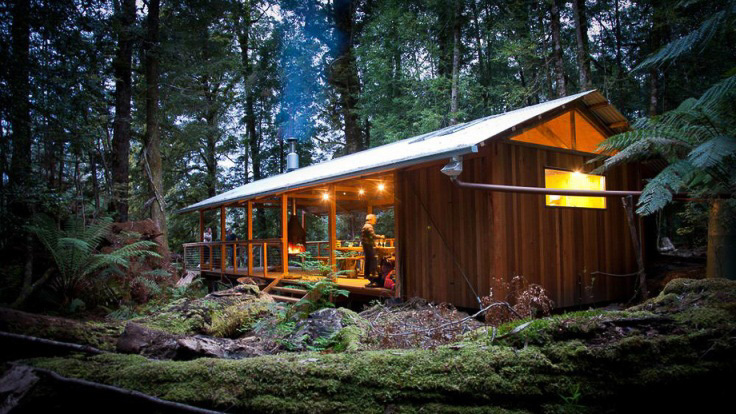 Deluxe Tipees and self contained cabins at Huon Bush Retreats less than an hour drive south of Hobart. Cost includes accommodation and access to the private nature reserve with wildlife and walking tracks. Access to the South West Wilderness camp is by a magnificent flight in a twin engine Islander aircraft, landing at Melaleuca. During your flight you will witness the grandeur of this lost world and see some of the icons of Tasmania’s world-renowned wilderness, such as Federation Peak, The Western Arthur Range, Precipitous Bluff and Tasmania’s rugged South Coast. Upon at arrival at Melaleuca, you will board a vessel to access the camp and to explore the magnificent waterways of the Port Davey Marine Reserve, with its 800 metre mountains rising from the sea. Your experienced guides will look after you, prepare your meals and give you a thorough interpretation of this spectacular wilderness area. Tour the area on foot or by boat!